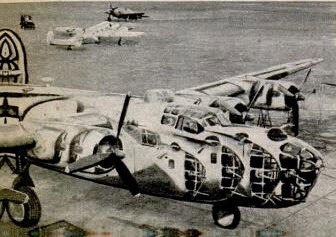 This B-24 wears an experimental dazzle ‘mirror’ scheme in 1945, either that or you’re more tired than you think. I planned to do my homework for this article, but I’ve decided not to. Maybe this is because a hot bath seems preferable to scouring obscure aviation books, or maybe it’s because I hope somebody will read this and give me the answer I want. Military aircraft have long carried national markings. It’s a good idea as they can reduce the chance of ‘friendly fire’ incidents. You’re probably aware of the famous one used by both the RAF and 60s mods, the mean black and white cross of World War II German aircraft and the rather camp USAF roundel. A roundel by the way is a circular symbol, so the USAF’s is slightly impure as it has horizontal protrusions. Occasionally aircraft markings need to be changed as they look too much like those of the enemy. The large red circle in the centre of RAF roundels was too similar to the Japanese air force’s so RAF aircraft operating in Asia became two-tone blue affairs. This we all know and are comfortable with. 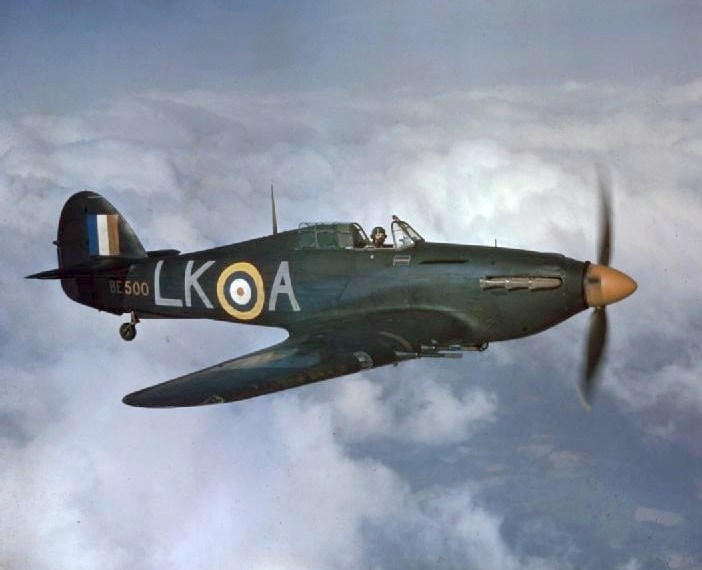 This 1942 Hurricane wears a ‘Special Night’ scheme that both increases and decreases the aircraft’s conspicuity. My head hurts. There was always an odd contradiction in national markings being used in conjunction with camouflage: markings are designed to be conspicuous and camouflage to conceal or at least confuse. In the early part of World War II the RAF found the white in their roundels too conspicuous so made the white band thinner and in some cases removed it altogether. When D-Day came the danger of friendly fire was deemed greater than the threat of the enemy and subsequently highly visible ‘invasion stripes’ were added (also, the large numbers of aircraft close together rendered the early IFF transponders useless). 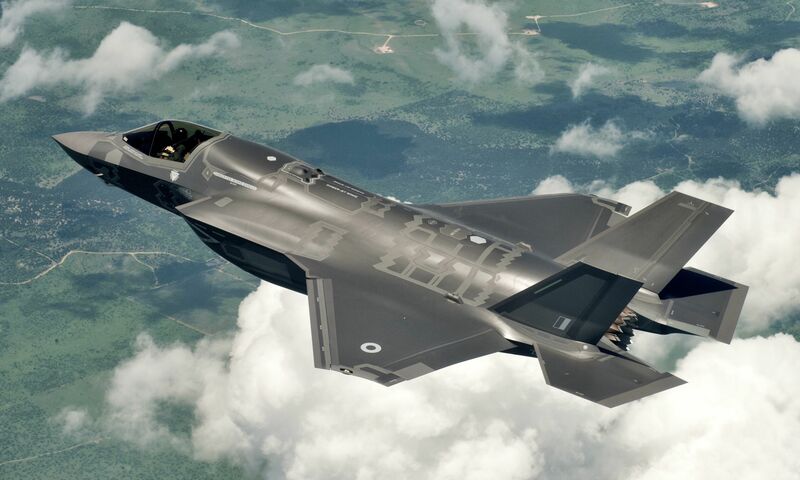 The UK’s F-35B resplendent in almost completely anonymous markings. Before I get side-tracked let’s jump straight to the subject in hand. What is the point of ‘lo-viz’ markings? From the late 1970s to the 1990s all military aircraft went grey. It was found to be the best all-round camouflage and soon fighters, bombers and even transport aircraft all went grey (with very few exceptions). Modellers from around the world killed themselves due to the tedium and enamel paint producers tipped gallons of brilliant hues out into canals and tripled production of the universe’s most boring colour. 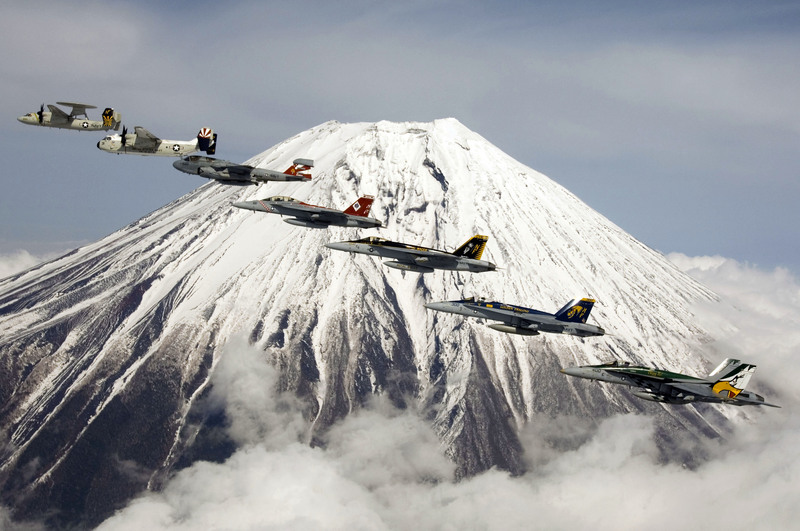 The commanding officer of each United States Navy Carrier Air Group gets a jazzily-painted plane. RAF roundels became washed-out ghosts of their former selves. Red became pink, mid-blue became the pale blue of invalid cars of the 1980s. In the 2000s it became even more extreme with some roundels losing their colour altogether and becoming grey, often making national identification by symbol alone close to impossible. So are those symbols supposed to be seen or not? The idea of low-visibilty traffic signs is preposterous, so why ‘lo-viz’ aircraft markings? Is it an attempt to pay lip-service to international conventions while optimising camouflage? If this is the case then the rules are so weak and silly then maybe they’re not worth following- where are these rules set anyway? Who invented them? I leave this to you wise reader to solve as my bath is almost run and I’d like another glass of wine. A fascinating article on aircraft camouflage can be found here. A Buffalo in a very attractive dazzle scheme. The roundels aren’t even faded colours now, they’re just grey. The Dutch one is similar to the Czech one, for instance, and unless you know which angle line is meant to represent which colour I don’t know how you’d discern it from a distance (not that they share many aircraft types anyway). I think the simplest thing is say is just that there are two directly contrary issues at play; staying hidden vs being clearly identified. Circumstances have caused wide swings on which issue was considered the higher priority. And sometimes, individual crews may disagree with official policy; which leads to garish individual artwork or markings on a “camouflaged” aircraft, or hastily applied field camo on a bare metal aircraft. I’d also add that the various “dazzle” schemes are sort in a category all their own. They aren’t even about hiding anything,they’re more about causing confusion or misdirection. Maybe causing the enemy to misinterpret the aircraft’s distance or movement. Admittedly they don’t really look very effective, but it think the idea is just that when split seconds matter for getting a shot, causing a moment’s hesitation could be life saving. Of course, nobody uses such schemes anymore. I know most major navies had decided by the end of WWI that dazzle schemes on ships didn’t do much good. And the practice was only teased at on aircraft and tanks in WWII. It’s complicated and time consuming, and seems to offer no provable benifit. Interesting. I don’t known about the naval marking part of the Hague conventions, but do know that they prohibited aerial bombardment in general. Most engagements now occur at the maximum range possible as allowed by radars and missiles with tens of miles of range. Visual markings are not relevant at these ranges. Most air combat will take place at night to maximize the advantage of available technologies. Markings are ineffective at night (lights off). Electronic IFF systems have evolved to allow ID of which side a potential target belongs to. The advent of Stealth aircraft has other techniques of ID to be used. The only fratricide events I’m aware of in recent memory involved mis-set IFF or violation of a delousing procedure at ranges where markings would not have helped. My thought is that full colour markings have a higher IR signaler and that grey paints may have some anti IR and radar effects. It’s probably something really prosaic – bear with me here. In the 1980s British Airways had this brilliant idea of painting every single aircraft with a unique tail design. Beautiful they were, a flying art gallery, they represented both the best of british and a truly global cultural engagement. and then within 18 months they scrapped the whole plan and went back to a common design. Why? Control towers. The one area where visual identification and control of aircraft is critical is the busy apron and airport environment. So, I suspect that the main reason markings remain in any form on low vis aircraft is to give a fighting chance to the men and women who ensure they are able to get off the ground in one piece. National markings aren’t ‘as’ important as squadron markings perhaps, but they are handing in a multinational deployment. There’s also the ‘fly the flag’ angle. And that has two facets – 1a. esprit de corp (yay go team us, look at the arbitrary symbol we associate with our historical accident of geography and governance, I shall now fight and die a bit harder) 1b big stick (hello little country a long way away you may have noticed in the newspapers etc that fighty killy things with our flags on are now near enough to you to be a bit of a worry if you get frisky). You need some kid of individual aircraft identifier otherwise Biggles is going to get into Ginger’s F35 and then have to waste time messing around adjusting the seat and wing mirrors, raising the seatbelt loop on the door pillar and retuning all the radio stations from Smooth FM to MIIXX 94.5.